Christmas tree growers in Watauga County organized the first mountain incorporated association to advance the interests of the nursery industry in February 1980. The growers that were instrumental in organizing the Watauga County Christmas Tree Association were Kenneth Dotson, Tom Foxx, Marvin Storie, and Harry Yates, along with County Extension Director, Gene Brewer. The first Board of Directors included Herbert Aldridge, Ray Clark, Kenneth Dotson, Raymond Farthing, Tom Foxx (Vice President), Marvin Storie, Denver Taylor, Bobby Yates (Secretary/Treasurer), and Harry Yates (President). 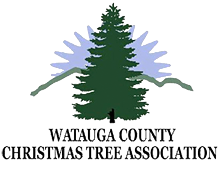 Members voted in 2006 to change the name of the association to the Watauga County Christmas Tree Association in order to better represent the actual membership base. • To advance the interests of the plant nursery industry. • To collect, preserve, and circulate valuable and useful information relating to the business of the nursery industry. • To promote research intended to improve the production, handling, marketing, use and maintenance of horticultural and environmental plants. • To promote the betterment of markets for horticultural and environmental plants and related items. • To publicize the current grade standards or techniques used or recommended for determining plant quality. • To strive to promote the best interests of people engaged in the nursery industry. For more information about the Watauga County Christmas Tree Association, please contact Susanne at 828-264-3061 or E-Mail Us. Every Christmas tree farm in Watauga County is a family farm and provides a unique experience to celebrate the small farmer. Trees are grown at high elevations where conditions are perfect for the native Fraser Fir Christmas tree. By supporting these local farms, the viewscapes of Watauga County are preserved and provide essential habitat for songbirds, deer, quail, turkey, bear, and other small mammals. Quail Unlimited has recognized Fraser fir Christmas tree farms for supporting critical habitat needed for Bobwhite quail survival. As Christmas trees are harvested, new transplants are continually replanted, to continue the support of area wildlife. For those who are concerned about the conservation of open land and ecological habitats, tree farms are a natural partner. • Maintains membership information on this Website. • Helps each other (members buy from other members first). • Organizes Choose & Cut days annually, representing members through mass marketing projects and distributing brochures across the state. • Interfaces with local government on grower’s behalf. • Presents educational meetings, summer tours, and annual Fraser Fir field day. • Maintains an answering service at 828-264-3061 and this Website to respond to all inquiries. • Addresses issues that will affect Christmas tree production. If you would like to become a member of the Watauga County Christmas Tree Association, please complete a copy of our Membership Application, and return it to the address listed on the application. Watauga County lies in the northwest corner of the state of North Carolina. The county is home to popular tourist destinations such as Boone, historic Valle Crucis, Blowing Rock, and Tweetsie Railroad. Grandfather Mountain and Pisgah National Forest are also just a short drive from the Boone area. Watauga County is also home to 3 time National Football Champions, the Appalachian State University Mountaineers. Throughout Watauga County one can find acres of lush green fields of Fraser Fir Christmas trees. • Exceptional needle-retention, as compared to other tree species, which ensures that needles stay on branches and off the consumer’s floor. • Pleasing fragrance, which persists year-round, and for many consumers defines the true sensation of the Christmas season. • Strong, upright branches, which are perfect for displaying lights, ornaments and garland. Driving times are approximate to downtown Boone, North Carolina. Allow extra time in snowy weather. Johnson City, TN: 1.6 hours. Winston Salem, NC: 1.8 hours.